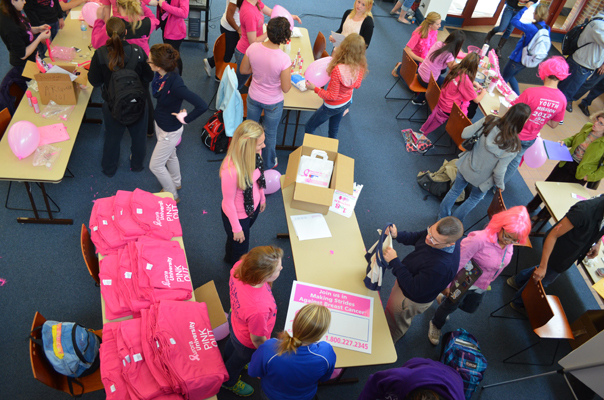 Students in Dunham Hall participate in the AU Pink Out fundraiser that was held in support of the American Cancer Society and the Making Strides Walk. Leadership and philanthropy are among the many valuable skills that students of the AU Honors Program learn each year. 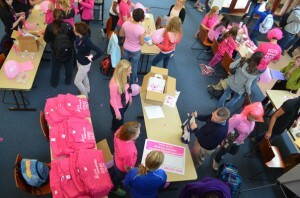 This semester students in Honors 1600, led by Toby Arquette, Associate Professor of Communication, and Andrea Kowalchuk, Assistant Professor Religion and Philosophy, are undertaking a service learning project with the American Cancer Society (ACS) in which they will apply the skills they are learning to raising money and awareness in the fight against breast cancer. Arquette and Kowalchuk are implementing a service learning component in the curriculum to help students understand the link between the classroom and community. Service learning integrates meaningful community service with instruction, essentially giving students real life experience applying skills they’ve attained in the classroom. For two years, the Honors Program has partnered with ACS to give students the hands-on experience of leading their own service learning project. Last year, the Honors Program raised more than $1,300 for Making Strides Against Breast Cancer (Strides), a noncompetitive 5K walk hosted by ACS in which proceeds benefit victims of the disease. AU Honors students this year are brainstorming ideas to help them reach their goal of raising $2,500 for cancer research and care and support of women who have been affected by breast cancer. Along with raising money, the class will also participate in the Strides 5K walk on Sunday, October 14, at Chicago Premium Outlets in Aurora. They will volunteer for various service roles, such as setup, registration and teardown. Anyone is able to make a donation to help the AU Honors Program reach its goal of $2,500. Donations can be made online by visiting makingstridesfoxvalley.com and searching for “AU Honors Program.” The students also will be hosting various activities around campus this fall to promote the event and raise money.